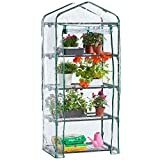 Greenhouses are mostly used by botanists who study plant, plant growers at a commercial level, and dedicated gardeners who take a deep interest in gardening. 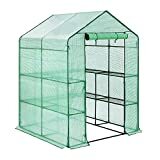 Greenhouses are very useful in cold climates as they allow easy access to sunlight, but they trap the heat inside so that plants can grow in suitable conditions. Visible light enters unhindered and warms the interior as the material within absorbs the sunlight. The same covering traps the heat as it reflects the energy back and prevents the wind to carry it away. Ideal for germinating seed, propagating, plants growing and protecting fruit and vegetables or simply extending the growing season. Complete gardening kit to grow cress, sunflower & coleus. 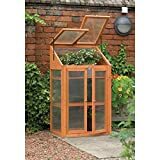 Build an easy greenhouse & get growing all year round. The greenhouse can hold enough plants, gardening tools, etc. 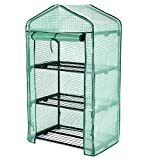 Tie the cover to the frame so that the greenhouse will be sturdy and stable;Comes with 6 U-type ground pegs to fix frame, make the greenhouse more stable, can prevent it from blowing away. 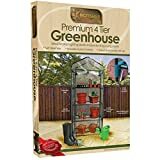 This green house is ideal for your backyards or homes; place on a deck, patio, or balcony, it features UV protection, weatherproof and insect prevention, will create a perfect room for your plants. Solid structure of powder-coated steel tubes; diameter of 16 mm and thickness of 0.32 mm; 2 layer mesh shelf for flowerpots, 10 iron wire mesh plates, each mesh plate weight limit of 25kg. 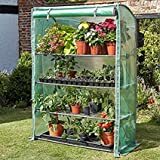 Roll-Up zippered door makes it easy to get in or close the greenhouse. 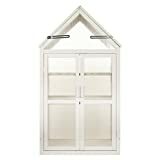 Zip up and provide a warm and windless room for your plants, where your plants will grow up safely. 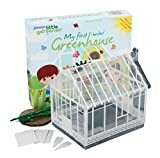 EASY ASSEMBLY- With no tools required, the greenhouse is easy to assemble! Simply follow the included instructions and connect the rods. Rope and anchors are included for stability, and each shelf comes with zip ties to ensure they can't be tipped over. 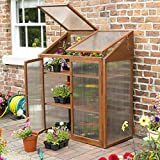 If you have a spacious garden in your backyard and you happen to be an enthusiastic gardener who takes a keen interest in gardening, then you may be interested in acquiring an appropriate greenhouse that would meet your needs better.